TALLAHASSEE – Gov. 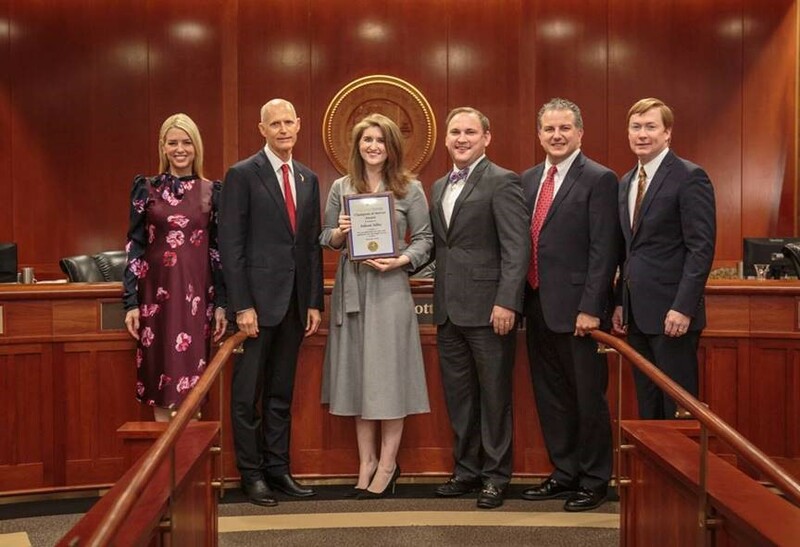 Rick Scott and Volunteer Florida CEO David Mica Jr. presented Ashton Adler with the Volunteer Florida Champion of Service Award, Florida’s official statewide volunteer recognition, during the Dec. 4 Cabinet Meeting here. Ashton Adler is an exceptionally active volunteer with Honor Flight South Florida. The mission of Honor Flight South Florida is to transport World War II veterans and veterans of subsequent conflicts to Washington, D.C., allowing them to visit the memorials honoring their service and sacrifices. With more than 1,000 World War II veterans dying nationally every day, Ashton works tirelessly to raise awareness of the organization and recruit participants from Broward, Monroe and Dade counties. Since Ashton joined the Board of Directors in 2013, she has served as the Secretary, Meeting Coordinator and Guardian Trainer for Honor Flight South Florida. She has arranged silent auctions to raise money for the organization and hosted appreciation events for veterans throughout the year. In that time, the organization has grown from 16 veterans on the initial flight to more than 500 participating veterans.